These plant species grow in the salt spray and loose sand of beaches and the moist lowland slopes of volcanoes. They flourish in poor soils and under very harsh climatic conditions. Coconut Palms (Cocos nucifera) and vines of Beach Morning Glory (Ipomoea pes-caprae) growing right down to the surf line. Shoreline of Ma'alaea Bay, Kihei, south Maui. This and the following sequence of photographs shows the stages of development of the fruit or DRUPE (the coconut fruit is not a true "nut") of a Coconut Palm (Cocos nucifera). 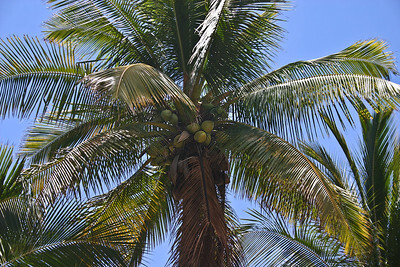 This image shows immature coconuts (fruits) that are still green. These coconuts are well along in the ripening process, just beginning to turn brown and developing a thick outer husk (or exocarp). If left unharvested, the nuts will harden and dry out, eventually dropping to the ground when completely ripe. 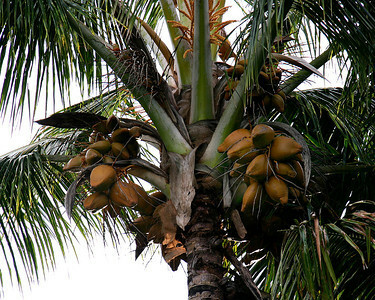 One of the hazards of living with coconut palms is that the large, heavy nuts commonly dislodge from their stems when ripe and fall to the ground with a good deal of force. I've never been konked by one of these but have come close on several occasions. 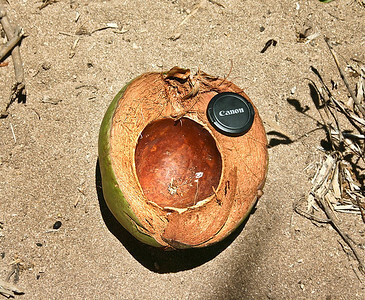 Here is a photo of an immature coconut (Cocos nucifera) that has just been opened to show the innards. The outer layer (exocarp) is greenish yellow (immature) to light yellowish brown (mature). The husk (mesocarp) is brown colored and composed of numerous thick fibers (coir). The inner "stone" (endocarp) is extremely hard, woody and hairy; it is the part of the fruit sold in US mainland stores as a "coconut." In the image the "meat" and "milk" has been removed. This VERY mature coconut (Cocos nucifera) has just begun to dry out in the sun; its exocarp has lost its color and the fibrous coir of the mesocarp is beginning to show through. 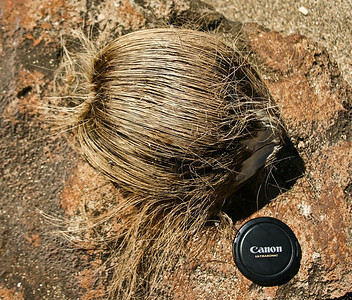 This coconut (Cocos nucifera) has been drying in the sun for a long time and the fibrous husk (coir) of the mesocarp is now plainly visible. Soon the hard inner core of the nut will be visible. 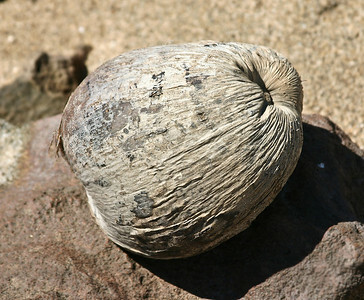 This image shows the hard inner "stone" (endocarp) of the coconut (Cocos nucifera). 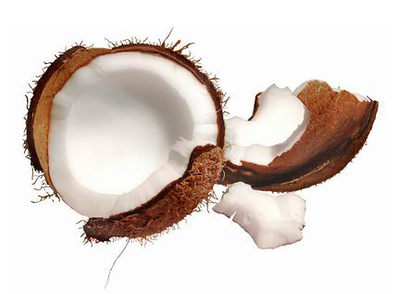 The white "coconut meat" is the endosperm. The liquid often referred to as "milk" is actually the cotyledon, a sweet, spongy mass that eventually dissolves and begins to absorb the endosperm. The product sold as "coconut milk" in stores is usually the liquid extracted from the coconut meat when it is pulverized. Note: "Endosperm" is the tissue produced in the seeds of flowering plants at the time of fertilization. It surrounds the embryo and provides nutrition (starch), though it can also contain oils and protein. 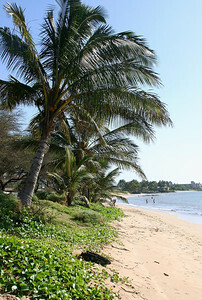 The half-buried fallen fruit of a Coconut Palm (Cocos nucifera) gamely sprouts in rocky alkaline soil along the beachfront at Kealia Beach, Kapa'a, east Kaua'i. 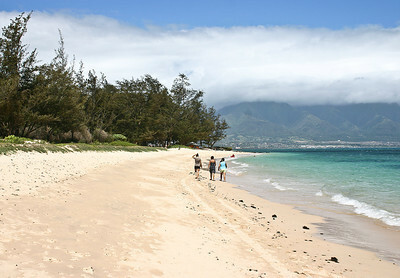 Kanaha Beach, Kahului Bay, north Maui. 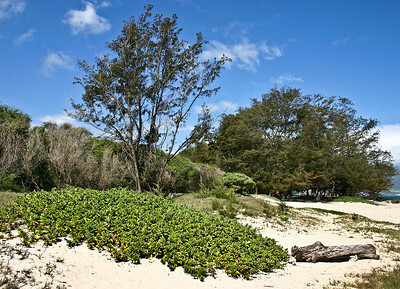 The local plant species help stabilize the white coral sands of this beautiful stretch of beach. The tallest trees are Ironwood, mixed in with Kiawe (mesquite) and Kukui (Candlenut) trees. 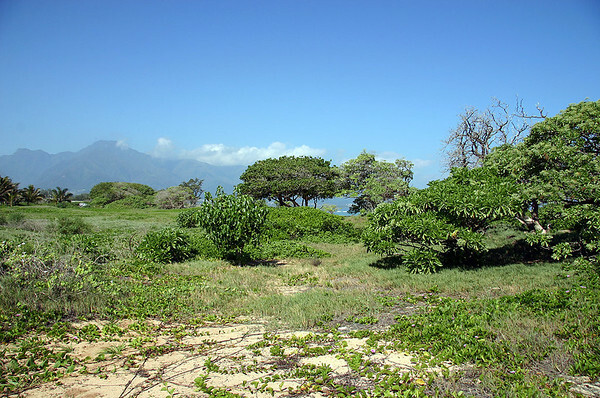 The tall bushes are Tree Heliotrope and the hummocky shrubs are Beach Naupaka. The stabilized berm at Kanaha Beach, Kahului, north Maui. 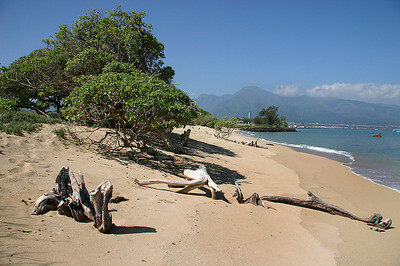 The stabilized sand berm at Kanaha Beach, North Maui. The sand berm behind the current beach sands marks the point where waves generated by the most severe storms drive sand and debris high onto the shoreline. Another older berm a few meters inland marks the location of an older beach. 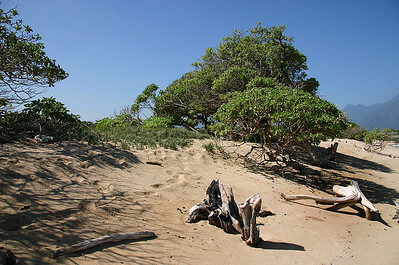 Tree Heliotrope anchored in the sand berm above the high-tide line at Kanaha Beach, near Kahului Airport, north Maui. The diverse flora growing on stabilized sand dunes behind the berm at Kanaha Beach, Kahului, north Maui. This unique habitat is being preserved and restored by Maui County and local volunteer groups and individuals. 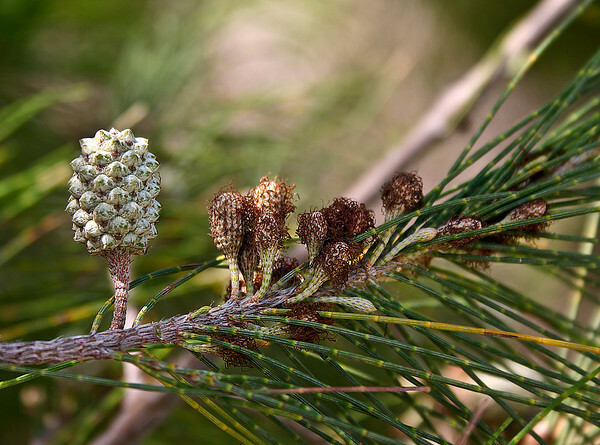 Several endangered and rare native plant species are being reintroduced here. 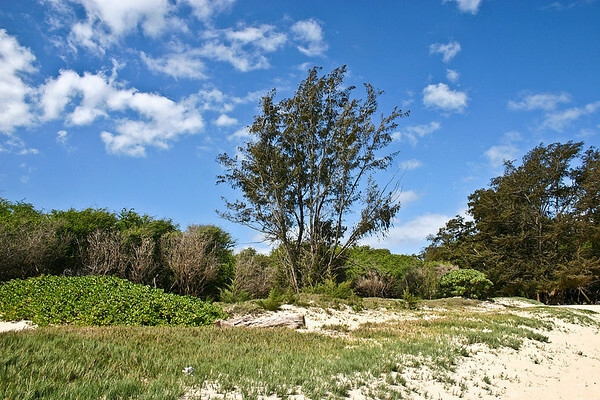 Tree Heliotrope, Beach Naupaka, Ipomoea vines, and various grasses and herbaceous species occupy this protected ecosystem. 'Aki 'Aki grass (Sporobolus virginicus) or Seashore Rush Grass, Kihei, Maui. 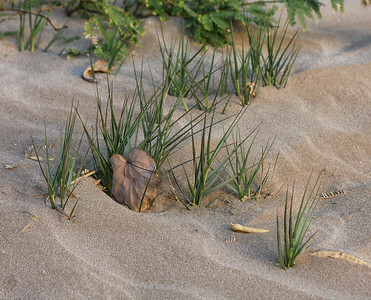 'Aki 'Aki grass (Sporobolus virginicus) or Seashore Rush Grass growing around a sand crab's burrow, Kanaha Beach, north Maui. 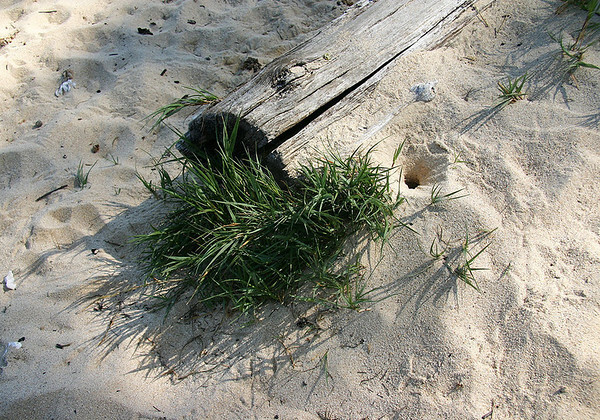 A spreading hardy grass that thrives on sandy & rocky shores. Indigenous to Hawaii and tropics worldwide. 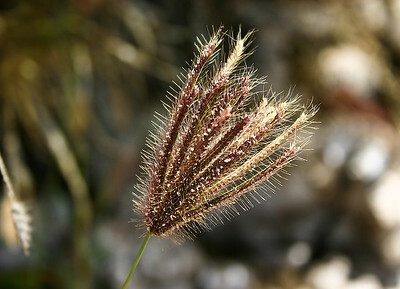 Mature seed head of Swollen Finger Grass (Chloris barbata), Ukumehame, west Maui. Kanaha Beach, north Maui. This photograph shows all of the species of trees, sprawling bushes, vines, and grass that help stabilize so many of Maui's sandy beaches: the tallest trees are Iron Wood (Casuarina equisetifolia), Kiawe or Mesquite (Prosopis pallida), and Candlenut or Kukui (Aleurites mollucana). The tall bush near the center of the photograph is a Tree Heliotrope (Tournefortia argentea). 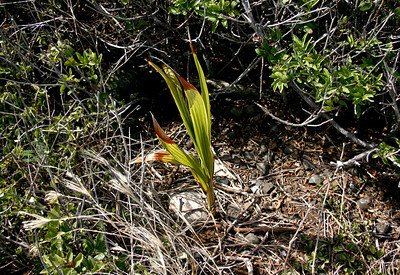 'Aki 'Aki Grass (Sporobolus virginicus). Kanaha Beach, north Maui. 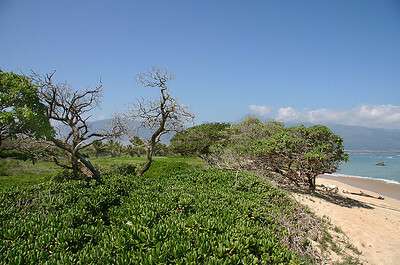 This photograph shows all of the species of trees, sprawling bushes, vines, and grass that help stabilize so many of Maui's sandy beaches: the tallest trees are Iron Wood (Casuarina equisetifolia), Kiawe or Mesquite (Prosopis pallida), and Candlenut or Kukui (Aleurites mollucana). The tall bush near the center of the photograph is a Tree Heliotrope (Tournefortia argentea). 'Aki 'Aki Grass (Sporobolus virginicus) carpets the stabilized dunes in the foreground. 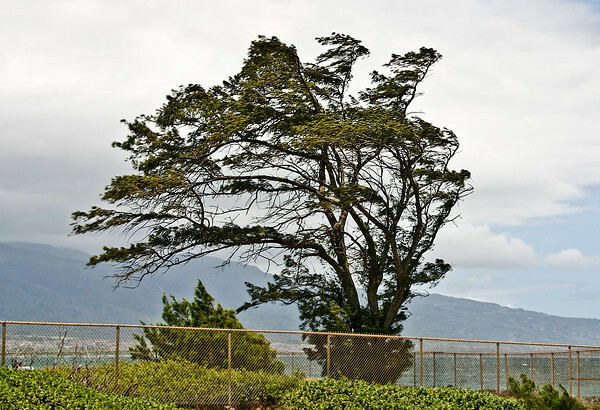 An elderly Ironwood Tree (Casuarina equisetifolia) leaning into the strong prevailing winds of Kahului Bay, north Maui. This species is well suited to withstand the strong prevailing Trade Winds of the leeward side of the island. However, it is vulnerable to the gusting hurricane-force winds common in the Islands during the summer months and is liable to be uprooted easily. 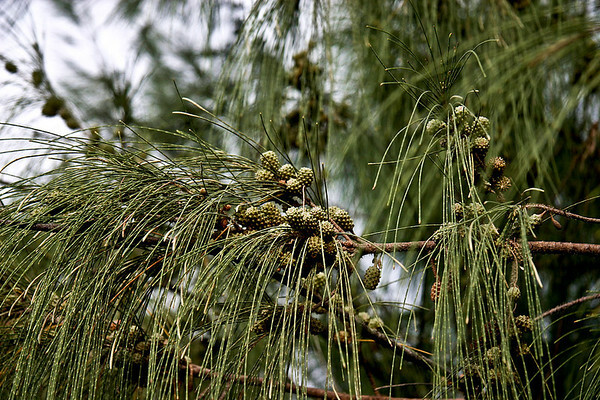 Casuarina equisetifolia, variously known as Ironwood (Hawaiian: Pa'ina), Coast She-Oak, Whistling Pine, Australian Pine, Horsetail Beefwood, Australian Oak, and Swamp Oak. 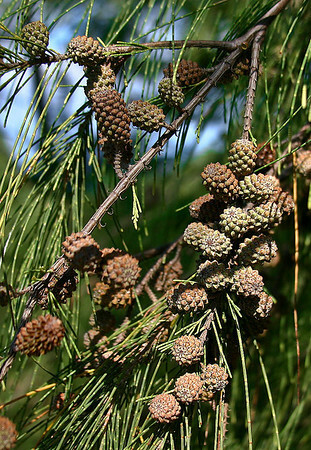 Despite it's appearance, it is not related to pine trees. 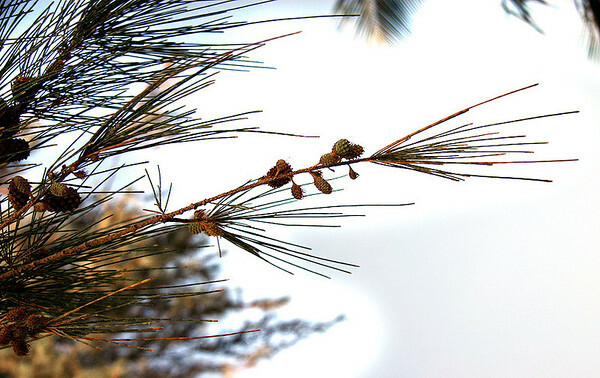 Has two flowers: a male flower at the tip of the "needle" and a female flower that appears to be a smaller "needle" growing at the base of the longer needle. Considered a pest species, as it forms dense stands of trees under which little else can grow. Maturing cone-like fruits of an Ironwood Tree (Casuarina equisetifolia) at the Spouting Horn beach, Poipu, south Kaua'i. 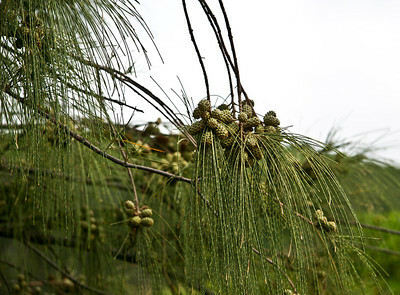 Maturing cone-like fruits and foliage of an Ironwood Tree (Casuarina equisetifolia), Poipu Road, Lawai, south Kaua'i. Maturing cone-like fruits of an Ironwood Tree (Casuarina equisetifolia) along a beach front in the Kawalilipoa neighborhood of Kihei, south Maui. Immature (right) cone-like fruits of an Ironwood Tree (Casuarina equisetifolia) Kanaha Beach, north Maui. On the left is a maturing fruit. Maturing cone-like fruits of an Ironwood Tree (Casuarina equisetifolia) at Ho'okipa Beach, north Maui.